During the Obama administration, internet service providers (ISPs) were reclassified as Telecommunication Service Providers. This meant that they would be treated like phone companies, as common carriers with all the regulation that implies. Prior to this they were classified as Information Providers which clearly made no sense since ISPs provide the network, not the actual content. 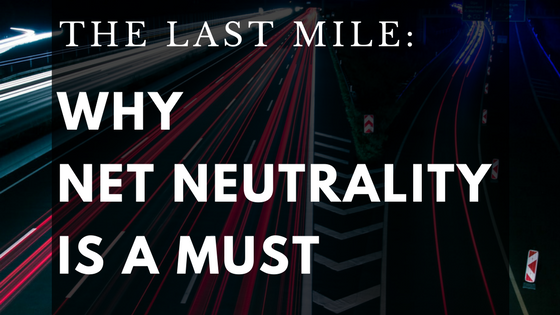 Most importantly, Net Neutrality prevents ISPs from providing paid fast lanes which would allow companies to pay ISPs to make traffic to their site faster than traffic to other sites. The FCC Chairman Ajit Pai believes that the regulation is unnecessary claiming that the Internet worked fine prior to the Net Neutrality rules. Ajit is not a stupid person. Having worked on regulatory issues and broadband initiatives at Verizon Communications, he knows full well that society is far more dependent upon the Internet than it ever was before. His claim is that the regulation is holding back competition and innovation. No evidence is presented to support this claim but it’s being made nonetheless. The central point of the claim is a specific definition of how the Internet works which TechCrunch has pointed out is flat out wrong. Many tech companies have come out publicly against repealing Net Neutrality. These are companies that can afford to pay for a fast lane but know how bad it would be for everyone except the ISPs themselves. Competition is actually an area no one seems to be talking enough about. I’m lucky to have at least two options for Internet service (Spectrum and AT&T). In some parts of Austin there are four ISP options. So there’s some competition here in Austin depending on where you live. For many in other less tech-centric cities, however, there’s only a single provider. In other words there’s no competition at all. Is this because of Net Neutrality? No. It’s because of the very high cost of the last mile, the infrastructure needed to get Internet service to every home and office. All those cell towers and all that cabling down highways, streets and right up to your front door cost a lot of money to put into the ground. Many years ago, I wanted fiber brought just from the street in front of our office into our building. The cost for that was $15,000. In most cities early ISPs were willing to bare this financial burden knowing that they were effectively being granted a monopoly by the city in exchange for the investment. Should the FCC overturn Net Neutrality, your ISP could choose to slow or speed up traffic however it wants. For example, AT&T could choose to slow traffic to Netflix which competes with AT&T’s Direct TV. If you’re a Netflix subscriber, this would be a bad thing and if AT&T is your only option for Internet Service, it’s not like you can vote with your dollars. You’re just stuck. Suddenly the Internet could go from a relatively level playing field to a pay-to-play model. The more you pay, the better the experience your customers will have at your website. Worse, if you don’t pay enough, your traffic could be slower. That’s a really nice website you’ve got there. It would be a shame if something happened to it. That sure sounds like racketeering to me. No evidence has been presented showing that Net Neutrality regulation is expensive to enforce. No evidence is presented showing competition or innovation being stifled as a result of Net Neutrality regulations. Arguments have been made that existing antitrust legislation and media pressure will keep the ISPs from becoming bad actors. There’s no evidence to support such a claim. However, after promising for years that it would not violate Net Neutrality and specifically paid prioritization (paid fast lanes), this past July Comcast backpedalled and is no longer making that promise. Comcast is actually a great example of what happens when there’s no competition. Comcast has a terrible reputation for customer service. I know many people who have Comcast as their ISP because they have no other choice. For me, that’s a deal breaker. I depend too much on the Internet to be at the mercy of such a company. Given the choice, I’d prefer not to live in a place where Comcast was the only option. But looking at the map below, not very many Americans have any choice. 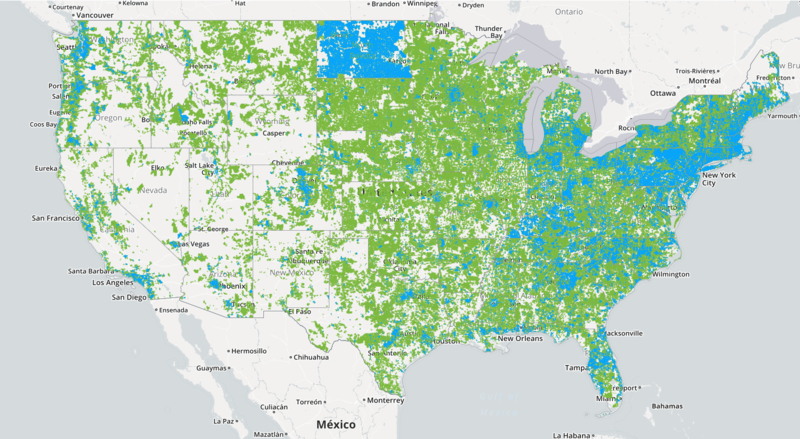 The map, provided by the FCC, shows the areas where there are 2 or more carriers (blue), 1 carrier (green), the white is none. It’s pretty clear that overturning Net Neutrality is not at all about competition and innovation. It’s about the fact that the large ISPs donate millions to various politicians reelection campaigns and now they expect to get what they paid for. If that doesn’t make clear the need for campaign finance reform, I don’t know what would. The FCC is going to vote on December 14th. You can make your voice heard on this subject by stating your opinion to the FCC via their website. Enter 17-108 into the Proceeding(s) field. Enter your full name into the Name(s) of Filer(s) field. You’ll need to provide your address as well. In the Brief Comments field I suggest you enter “I support Title 2 oversight of ISPs.” This takes only a few minutes so it’s well worth your time. The more people they hear from, the harder it will be to vote in favor of the repeal. Then President Obama appointed Ajit Pai to the FCC at the suggestion of Senator Mitch McConnell. That should have been a big red flag and I’m sure President Obama now deeply regrets that decision. Help make a difference and make your voice heard today.